In ''Kite Flyer, Portmeor, St Ives'' we can see how the textured surfaces of Beeson''s paintings develop through the application of self-ground pigments and other organic materials. Peter prepares his own canvases by attaching linen to board, then priming the fabric thinly across the weave to preserve as much of its character as possible. He tends to choose pigments, not just for their colour, but also for their grain size, for the way they feel on the brush or knife, or the way they build a surface. 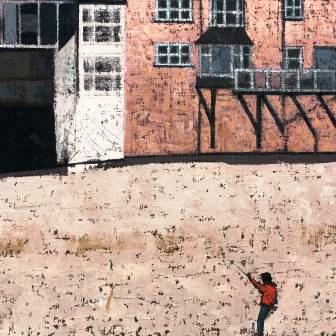 ''Kite Flyer, Porthmeor, St Ives'' shows the contrast between the linear quality of the buildings and the rough texture of the beach. The two are united by the small kite-flyer in the foreground. Each painting at Red Rag is sourced from the Peter Beeson artist studio and like all Red Rag British art and Contemporary art it can be shipped worldwide. Click here to view more contemporary paintings by Peter BEESON.